Teeth whitening can significantly lighten the colour of your teeth. It’s safe and highly effective. Teeth whitening is a great, simple and effective way to brighten up your smile. It does not remove any natural tooth material. Whitening only works on natural teeth and won’t change the colour of existing crowns, fillings, implants, veneers, bridges or denture teeth. These may need to be replaced to match the new colour of the natural teeth. Visit 2 – We fit the custom fit tray(s), take photos and your shade before treatment, and give you the gel with specific instructions on the do’s and dont's. Visit 3 – We usually review you 2-4 weeks later to take your new shade. 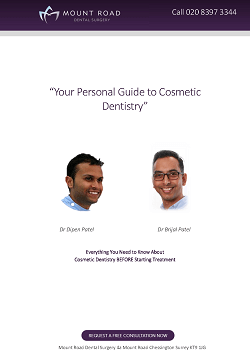 For a more information about teeth whitening, book a consultation with our dentists at Mount Road Dental Surgery. Simply call 020 8397 3344 or fill in the form below. Chair side tooth whitening involves the dentist applying whitening gel directly to your teeth, which is then activated by a special light. It is usually carried out in one or two visits usually lasting 60-90mins each appointment. We recommend supplementing this with the home kit to give the best results. For more information on Teeth Whitening or to book a consultation call us on 020 8397 3344.